Why keep a dream journal? Sounds good, but how do you know the enemy? Three words: your dream journal. In understanding the quote above, it’s helpful to think of the enemy as having many different faces and being many different things. The enemy can be physical: a bully at school; a rival; a boss or a friend. The enemy can also be non-physical: an addiction; self-doubt or a habit you want to break. It can also be a goal. You are the protagonist in the story of your life. What you do, what you’re concerned with, that’s the antagonist. The antagonist that Sun Tzu writes of is the enemy. The enemy is vital. To have a story, the protagonist needs an antagonist. In a story, the character always has a problem. If you don’t have a problem, you exist. You don’t do much more. Like both sides of an equation, you need your problems and your problems need you. The equation has balance and so do you and your enemies. It’s best to admit that and realize, in one form or another, they’re never going to go away. Of course, you want to prevail in your struggles to the point that you can. In the quote above, Sun Tzu, the master strategist, says the way to do that is to know your opponent and yourself. Keeping a dream journal, can help you know and understand yourself. All of yourself. Even the hidden part: your subconscious. It can also help you know the enemy as well — to a point. To be creative requires confidence. You supercharge your creativity by increasing your confidence and you do that by knowing yourself better, both your strengths and weaknesses. What makes you, you — your mind — has two parts: the conscious mind and the subconscious. The conscious mind is like a warehouse supervisor. It’s in control all day long telling your body and the subconscious where to go and what to do. The subconscious mind is like the warehouse itself. There’s a lot of stuff stored there: some interesting; some mundane; some funny, some downright scary. Everything that isn’t being actively examined by your conscious mind rests in the subconscious. It stores your experiences, your beliefs, your skills, all the situations you’ve been through and all the images you’ve seen. There’s more locked up in there than your conscious mind realizes. If you’re a normal, healthy person, these items usually only come to light in dreams. If you’re not quite so healthy, they come out in another way. The Dream Recovery System is a 10-step proven guideline for remembering more of your dreams in greater detail than you’ve ever done before. Once mastered, the effects on your life can be powerful. You’ll gain perspective on your experiences, your likes, and dislikes, your relationships and life itself. You might find yourself with a million-dollar idea, absolutely mystified or just incredibly entertained! Either way, remembering your dreams is well worth it. The Dream Recovery System makes it easier. Your subconscious is always at work weighing, analyzing and storing information in the background. It stays there, overridden by your conscious mind. The process helps bring this information out where it can be inspected. It is there you find enlightenment. How to keep a dream journal. Use the 10-step Dream Recovery System and write your dreams at the time you have them in a notebook or a special journal you have dedicated for the purpose. We have dream journals for sale at DreamRecoverySystem.com but there are other fine choices for sale on Amazon.com or Ebay.com. When you lay down for bed, tell yourself you’re going to remember your dreams when you wake up. Tell yourself you have to write your dreams down. Visualize yourself writing and recording your dreams upon waking. Sometimes it helps to have some kind of object present to remind you. People have used objects like a rubber band on the wrist or even a note. The sooner you reorient, the more likely you are going to be able to remember the content of your dreams. The rubber bracelet is also useful to snap to help wake you when you feel your will to write your dream slipping away. Keep your journal nearby: under the bed; under your pillow; on the nightstand. You want to be able to remember to reach for it and easily find it when you wake up. Use a paper journal, not a cell phone or computer. Don’t use a voice recorder either. Sometimes you’re going to have dreams with symbols and you can’t record those symbols properly. Prepare for writing when you wake. Have a pen or pencil handy along with a little nightlight. Ideally, you’ll have a lighted pen. This is so you can begin writing immediately upon waking with the page you’re going to write on bookmarked, perhaps with the lighted pen. You don’t have to keep the light on when you’re using the pen. It does help to see where you’re going to write when you first start writing. Upon waking, try to start writing by creating a title for the dream. It can be as simple as one word, say, “Falling” or “Dogs.” A single word helps focus your thoughts. Don’t worry about the date. You can add that later. You can also title the dream later. As you build skill, you can write a few keywords about the dream and go back and finish writing it down when you’re done. The longer you wait, the less you’ll remember so go back as soon as you can. If you don’t remember the dream or you don’t believe you had one, write “No Dream To Record” as the title. Date the entry. While this may be disappointing, it’s important for developing the habit of using the Dream Recovery System. Be patient! Dream journaling is a habit. Habits take time to develop. Once you have the title, use the acronym PACTREPS to help you note key details from the dream. Details are the key to understanding the dream. Dreams don’t always have a plot. Dreams often don’t make objective sense. That’s okay. Oftentimes the importance lies in the symbolism. It’s helpful to remember this acronym and what it stands for. P = People — Were there any people in the dream? Did they do anything? A = Animals — Were any animals prominently featured? C = Colors — Were there any colors that stood out? T = Modes of Transport — Was a journey involved? R = Recurring — Did you ever have this dream or a similar one before? E = Emotion — How did the dream make you feel emotionally? P = Plot — Was there a plot to the dream? It’s okay if it didn’t make sense. S = Setting & Sound — Where did the dream take place? Were there any sounds or songs playing? The Dream Recovery System Dream Journal includes the acronym on each page along with space for illustrations. Use this prompt to help you recall details from the dream. The more you can recall, the easier it is to understand what the dream means. 7. Reflect. What did the dream mean to you? What did the particular item in the dream mean to you? It’s best if you determine this for yourself. The subconscious is inclined to speak in symbols. Only you know what those symbols mean. 8. Be patient. This is a process of self-discovery. That takes time. 9. If you are truly stuck, you can consult a dream dictionary or visit www.DreamRecoverySystem.com for dream analysis examples. The meanings of dreams tend to clarify themselves eventually. 10. Practice dream recall and dream journaling every time you go to sleep. Like anything, you’ll get better with practice. Record every dream you can. Sometimes dreams seem trivial right after you’ve had them. You can be writing them down thinking to yourself about how stupid the dream was. Later, when you’re looking back over your dream journal, you can be blown away by the insight shown by that dream. Keeping a dream journal online doesn’t work as well as keeping one in a notebook. Though there are several apps and websites dedicated to this, it’s difficult to draw on a website or in a phone app when you have to illustrate a symbol, cartoon or drawing to show from your dream. It’s also quicker to write in a notebook than to log onto a secure website and input a user name and password. Keeping it in a notebook is also less disruptive to your sleep. It’s also better for personal security as long as you can conceal it from prying eyes. Recording descriptions of your dreams may work for some people but they’re difficult to go back through unless the intention is to write them down the next morning. Again, you have the disadvantage that you can’t illustrate any scene from your dream. Furthermore, you’re more likely to wake up your bed partner by speaking into a recorder. Keeping your journal in a notebook also forces you to be more concise. Your interpretation is the best interpretation. However, if you want feedback on your dream, you’re free to share them on sites like DreamJournal.net and Reddit.com’s dream community. 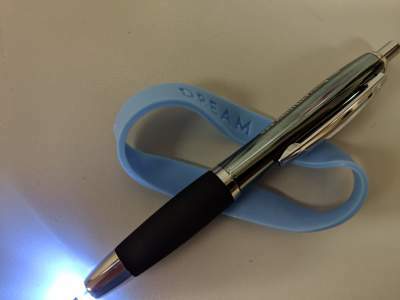 The idea pen for dream journaling is a pen with a light on the end. That kind of pen allows you to find the portion of paper you want to write on easier than an unlighted pen. Your entry will be easier to read. If you don’t have a lighted pen available, writing a few words with a regular pen in the dark can be helpful. You can use a regular spiral notebook or any other book with blank pages for recording your dreams. Be sure to head back here for regular commentary on dream journaling, helping you make the most out of your dreams. For another take on keeping a dream journal, see Ann Faraday’s rules at the end of this article.